We’re firmly of the opinion that leggings are not pants, but the one concession we make for tights is for the sake of running. We think they beat shorts, hands-down. But no matter where you sit on the controversial “tights vs. shorts” issue, we can all agree that the annual Vancouver Sun Run is worth lacing up your shoes for. The course is beautiful. Heading through downtown, The Vancouver Sun Run’s course then briefly enters Stanley Park, skimming Lost Lagoon before heading along the sea wall around stunning English Bay. Runners then go over the historic Burrard Bridge, through the False Creek neighbourhood and back over the Cambie Street Bridge before ending at BC Place Stadium. Run this course and you’ll have Instagram fodder for weeks. There’s something for all abilities. So you’re new to this running thing, but your friend is more of a Usain Bolt-type? No problem. The Vancouver Sun Run offers a wave-start based on your estimated finish time, meaning that pros start first and walkers go last. Want to run as a group? You just make sure that all of you enter the same estimated finish time – that of the slowest person. Along with the 10K, there’s also a 2.5K Mini Sun Run for the kiddos, and everyone is welcome at the celebration at BC Place at the end of the race. It’s a great time of year. By mid-April, Vancouver is a riot of cherry blossoms, magnolias and rhododendrons. The weather is perfect for running, with average temperatures around the 13°C/55°F mark. Lots of out-of-town runners come to Vancouver for the run because it’s the perfect excuse for a weekend away. Do we have you convinced yet? 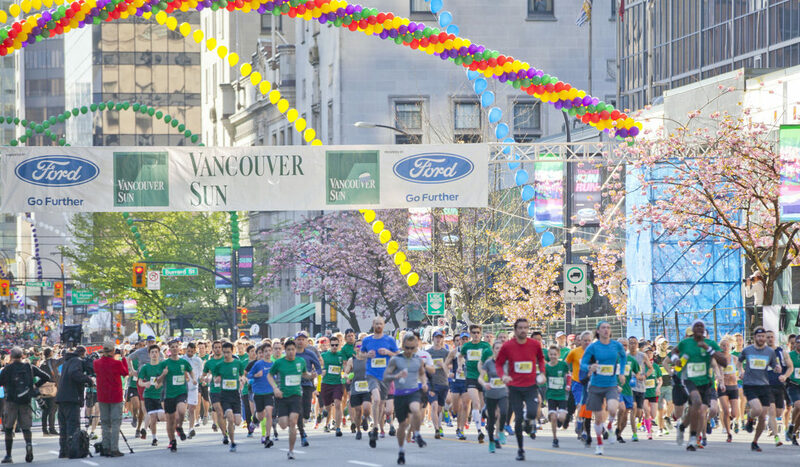 Register for The Vancouver Sun Run on the website, then check out our booking page to find a room.